Moved with Peach to Oahu. Mario always refuses to be placed in "the home". Like indeed this is gorgeous! I love your art style! What brush do you use for your lineart? Something about the style here reminds of Calvin and Hobbes. I just packed my NES in its original box ready for move, the old days always come with. 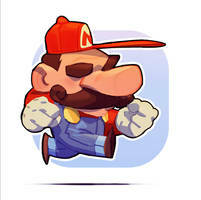 Remember Mario? IT WAS A GOOD GAME! You're too young to remember! IT WAS A GOOD GAME! What do kids these days have? Nothing. All hope is lost. "Remember Bobby's World? IT WAS A GOOD SHOW! You're too young to remember. IT WAS A GOOD SHOW!"